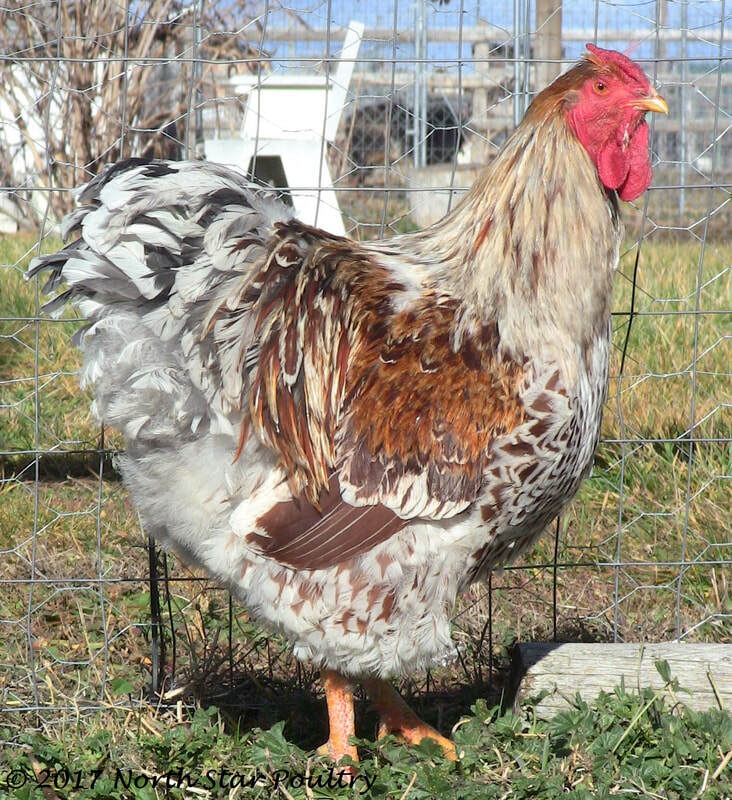 ​Q: How do I tell if young Blue Laced Red Wyandottes are roosters or hens? A: First of all, if in doubt, do not cull the bird as a rooster! If you are unaccustomed to looking at smaller combs like rose combs, they can be deceptive. The best young BLRW hens are often as large as the roosters for a period of time, and the hens' combs can be quite red as well. Generally the size and color of the wattles is a good indicator of gender. Roosters' wattles become more obvious (larger and redder) sooner than the hens. Roosters also tend to have a wider and somewhat redder comb than hens. Besides these indicators, there are several others that I use to determine roosters and hens: (1.) Feather Growth. Roosters feather out slower than hens. Their backs can be bare for a period time and sometimes their tails don't grow in completely until quite a while after the hens. (2.) Structure. Roosters are generally wider and sturdier in appearance than hens. Hens are lighter boned. As you gain experience, you can almost distinguish roosters and hens simply by roosters' heavier build throughout and especially in the head. (3.) Legs. Roosters are lankier with longer legs and larger feet. (4.) Feathers. Some young roosters are distinguishable by feather gloss after their first juvenile molt. Their saddle feathers have a shiny edge noticeably different from the rest of the feathers, whereas the hens' are uniform throughout (though hens are still glossy, especially if they are blacks--it's that shiny "rooster feather" edge you're looking for). Other young roosters won't show this shine until after their second juvenile molt, when they grow in their shiny pointed saddle and hackle feathers, as well as the decorative, curved tail feathers. ​ Like I said, though, be careful when deciding if a chick is a rooster or a hen, especially if you haven't had much experience with Wyandottes or show-quality birds. The indicators I listed above are not always true for each individual, and sometimes it take a practiced eye to catch them. I can guess pretty accurately by the time they are six weeks old, but I prefer not to make a final call until the bird is eight to ten weeks old. Anyone can determine with absolute certainty if a bird is a rooster or hen by the time it is four or five months old. As a final note, determining gender by the bird's attitude is not always reliable. Hens can be little smart alecks and inform you of it with all sorts of roostery noises and gestures. And this is true for any breed. ​​Q: How old should young Blue Laced Red Wyandottes be to show? 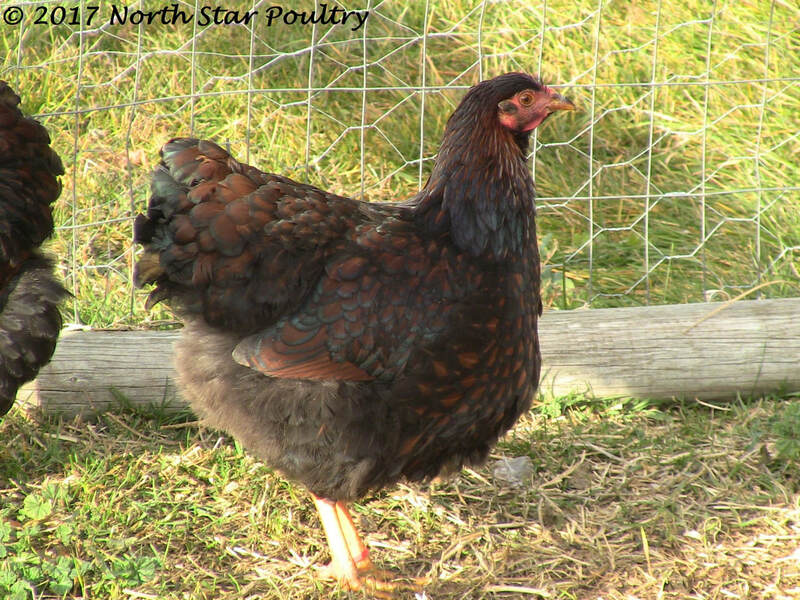 A: Blue Laced Red Wyandotte pullets are generally ready to show around six to seven months old when they are fully molted into adult plumage and in laying condition (which gives them the large red comb and wattles that add greatly to their appearance of good condition and quality). Cockerels generally show best around seven or eight months old when their hackle, saddle, and sickle feathers are fully grown in (without those feathers in, they appear awkward). In any case, BLRWs always look best when fully molted but before their feathers have a chance to wear or fade, and when they are in breeding condition with the bright red combs and wattles. Q: Why are there three different colors of Blue Laced Red Wyandottes? A: The three different color phases are caused by the Andalusian blue gene. All three colors are the same breed--it's just how it works with Andalusian blue. Genetics simplified, chickens have two copies of each gene, one inherited from each parent. There are various forms of these gene copies that cause different outward effects. Andalusian blue chickens are basically a black chicken with a "lightening" factor. By "luck of the genetic draw," a black-color-phase BLR Wyandotte does not inherit a blue gene from either of its parents, thereby allowing the chicken's base color (black) to be expressed. A blue color phase chicken inherits one blue gene from one parent and a non-blue gene from the other parent. The one blue gene lightens the black to the "blue" color (it's similar to adding a drop of white paint to black and getting gray). The splash color phase chicken inherits two blue genes, one from each parent, so it gets a double lightening dose and appears very light blue or nearly white. See the pictures below for examples of the three phases. A: If they receive sufficient light (14-16 hours), whether it is natural or artificial, young BLRW hens should begin laying at six to seven months. This is a little longer than you'll see in most hatchery birds simply because high-quality birds, since there is more size and style to them, take slightly longer to mature than most hatchery stock. ​Q: How many years do Blue Laced Red Wyandottes lay? ​A: I would expect three good laying years from a BLRW hen. I keep good breeding hens for two years without a significant drop in production between the first and second year. I keep my top hens until they are three, and I keep the very best of the best longer than that. ​Q: How many eggs does a Blue Laced Red Wyandotte lay a year? A: Based off of a 2014 evaluation I conducted, I estimate that first-year BLRWs lay approximately 200-250 eggs a year. (Laying is, of course, affected by broodiness, heat, cold, molts, environment, and the individual hen.) Older hens will lay fewer, larger eggs. During the spring from a mixed flock of twelve one- and two-year-old hens, it would be normal to get eight to nine eggs a day. 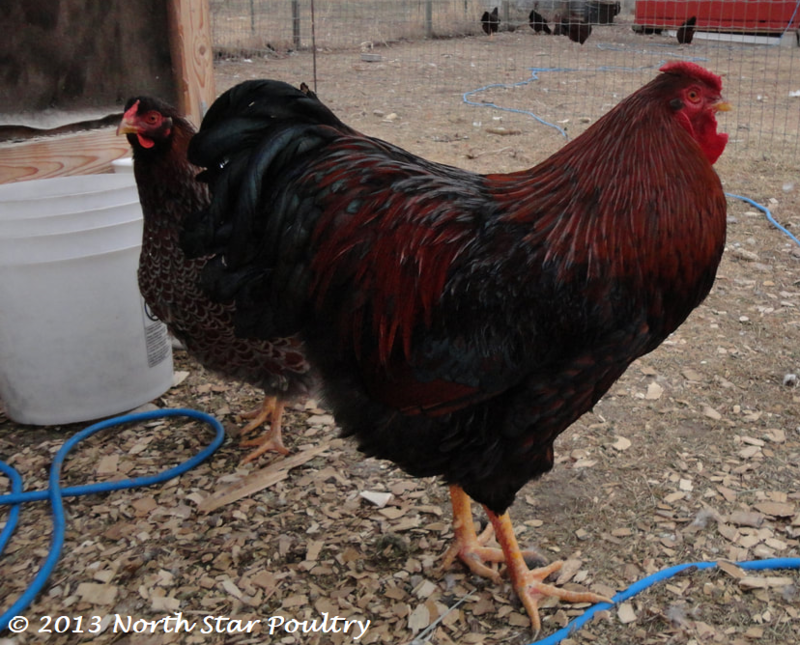 ​Q: When are young Blue Laced Red Wyandotte roosters harvestable? ​A: Young roosters can be harvested at around four months after completing their first molt. There is a window of time that you notice when handling them that they are nicely balanced--go much longer and they become gangly. Four month olds are smaller but more tender than older birds and very flavorful. However, if you are planning on selecting breeding roosters, you should only harvest four month olds if you know for absolute sure that they are culls. Sometimes the youngsters you think are second class mature into the best adults. ​ Young roosters can also be harvested at five to six months old. They are more filled out than four month olds, though less tender, and at five to six months you should be able to select the top birds for breeding. I hold onto any extra roosters that show potential until they are at least seven months. Sometimes they mature very nicely, and it's my preference to give them a little more time rather than risk losing a good breeding bird. ​ Whenever you harvest roosters, you should make sure they are not molting. BLRWs have an abundance of feathers, and if the feathers are in their pinfeather state, they can cause plucking difficulties. ​Q: When can I start selecting Blue Laced Red Wyandottes? ​A: You can start selecting BLRWs as soon as they hatch and through their whole growing-up period. I make my final young-bird selection when the birds are about six months old (fully molted into adult plumage). Hens can be selected a little sooner than roosters, and seven months is not too long to wait on roosters. I select again after the birds have finished their first adult molt (around eighteen months old), at which time they are fully mature. I keep only the exceptionally outstanding birds for a second breeding year. 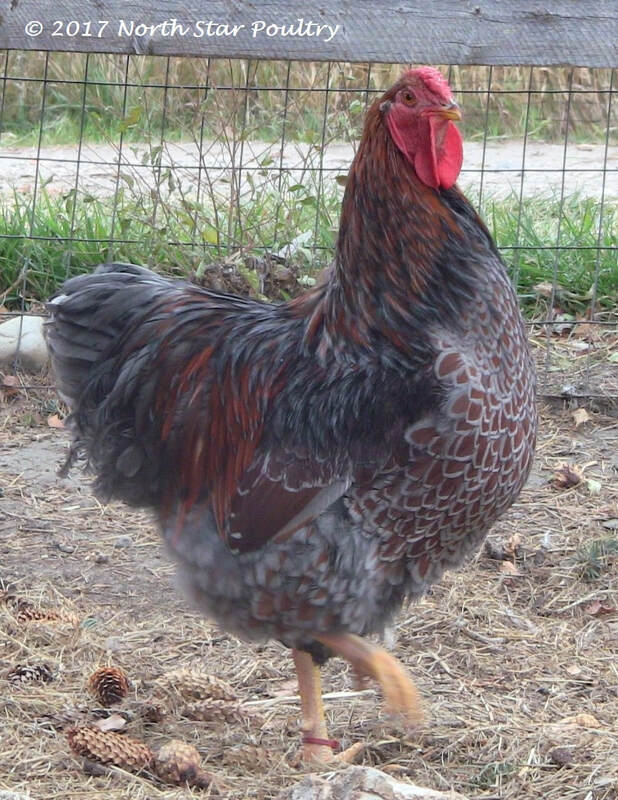 ​Q: How long does it take for Blue Laced Red Wyandottes to fully mature? ​A: BLRWs complete most of their growing by the time they are seven or nine months old. However, they are not full grown until eighteen months old. They'll put on a little more size and substance. Their feathers come in fluffier with often crisper color when they molt at about eighteen months. 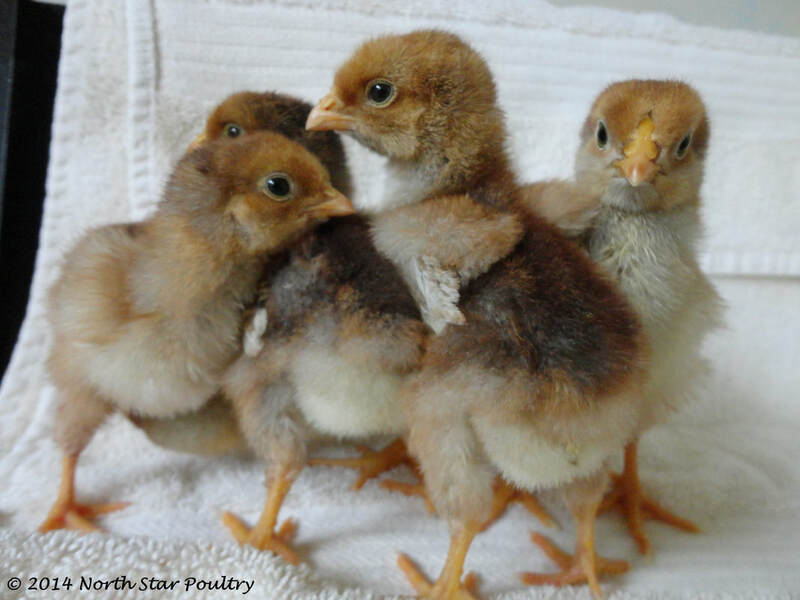 ​Q: Why are my Blue Laced Red Wyandotte chicks taking longer to grow feathers? 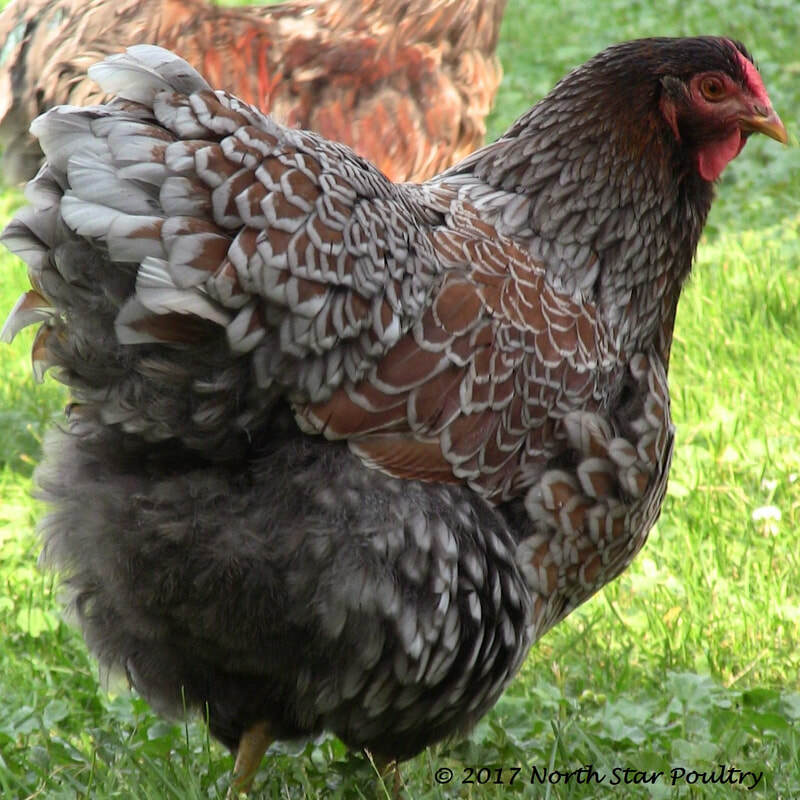 A: Soft-feathered breeds, like Wyandottes, take a little longer to grow their feathers than harder-feathered breeds (Rhode Island Reds, etc. ), and Standard-Bred birds generally feather slower than their hatchery counterparts, anyway. The advantage to slower-feathering Wyandottes is better quality of feather, noticeable in width, gloss, color, and fluffiness. Make sure that older Wyandotte chicks starting to grow their feathers are not tightly confined and bored, because they can start feather picking. As with any breed, mixing ages can also result in feather picking when one age is growing feathers but the other age isn't yet or has already. BLRWs should be fairly well feathered when they are eight or ten weeks old. (Small batches of chicks are less prone to feather picking than large batches.) You may notice some smaller chicks that have only grown in their wing feathers, while everyone else is mostly feathered. These slow-maturing chicks are fine for layers or meat birds, but I don't recommend using them for breeding. They mature too slowly to be practical. Penguin Walking and Selecting Against It. ​ "Penguin Walking," as it is generally described, is a genetic disorder that came with this strain of BLR Wyandottes. Penguin Walking generally manifests itself in birds under five months old. The bird's hips break down, causing it to walk with an upright stance. When seen in older juveniles, usually only cockerels manifest it. Hip asymmetry, which I believe to be related to Penguin Walking, does show up in pullets, as well as cockerels, though to a much more limited degree. I am still working out the details on this issue. From what I have learned, it appears to be tibial dyschondroplasia (a common problem in meat breed chickens) or a similar disorder. Tibial dyschondroplasia has been bred out of strains of meat chickens in about nine generations. ​ Penguin Walking seems to be somewhat preventable and possibly treatable. Young chickens that are overcrowded from chick-hood or onward seem to be particularly susceptible, so keeping them well-spaced, minimally stressed, and getting them outdoors as soon as possible is the best. Percentage wise, small groups of chicks show up with it much less than large groups. One person successfully cured a pullet by treating her with very large doses of vitamin D3. I am currently working to breed the problem out of the strain by the following methods: I do not retain chicks that hatch malpositioned if I can find them before they hatch; I select out the slow-maturing chicks at around six or eight weeks (I think slow maturing and "Penguin" could be related, though I have to do more experimentation before I know for sure--but in either case I don't want the slow maturers anyway); I check all young birds to make sure they have symmetrical hips; I select out birds that show weakness in stance. I don't treat the problem because I want to get rid of the genetic propensity for it rather than "cure" it. ​ I won't sugar coat the issue. It is something of a hassle. I do, however, believe that with proper selection it can be eliminated from the strain.